The Port Townsend Marina is actually two marinas, one small one on the west end of town, and the other huge marina on the eastern end of town. 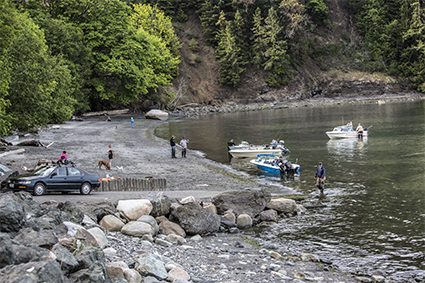 This weekend was a beautiful sunny weekend, and after a long winter, boat owners, and especially commercial fishermen were eager to get their boats in the water. Some were pulling their boats out of the water for maintenance. I’ve always been impressed with the process of lifting a big heavy fishing boat out of the water, and I document one here. I enjoyed the activity and thought you might, too. Port Townsend Marina is only 30 minutes from Sequim and the famous John Wayne Marina. We also have a Port Angeles Marina, a Port Ludlow Marina, a Port Hadlock Marina, and many more marinas in the area, which shouldn’t be a surprise since we are on a Peninsula surrounded by water. Port Townsend is a beautiful little city with 100 year old buildings and a small town atmosphere with a hundred cute little family owned restaurants. One of the items on my bucket list is to eat at least once at every Port Townsend restaurant. I suspect I’ll be old by the time I check that one off my list. Since Port Townsend is only a half hour drive from Sequim, it is one of my favorite places to drive on a sunny day to enjoy an organic healthy lunch and then to walk the docks and piers and soak in the sunshine and the beauty of creation. Come and see us in Sequim, and be sure to visit Port Townsend Marina. 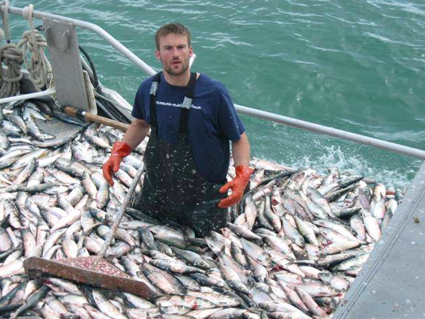 This young man is from Sequim but now he is fishing in Alaska, as he does every summer. This is my son, Brady Marunde. 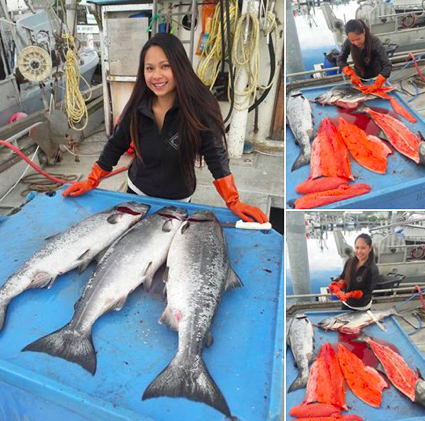 A lot of people who move to Sequim love fishing for Salmon, trout, and bass. My son loves fishing too, but since my family is from Alaska, it was natural that Brady would gravitate back to the greatest fishing holes in the world. 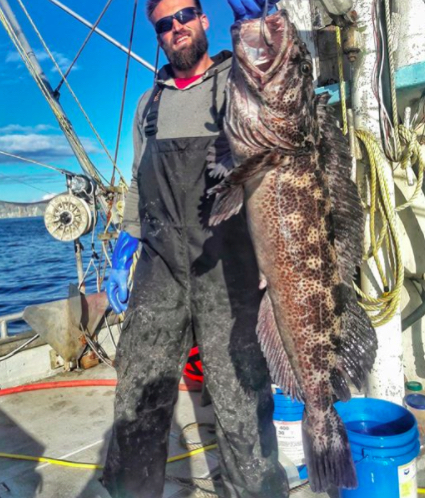 How about a huge Lingcod? This one was 62 pounds. Definitely keep the hands out of the mouth on this one. To put the size of this fish in perspective, Brady is 6’4″. My son’s fiance is Gwen. The last time I was with Brady and Gwen, she cooked up a meal of Salmon, Cod, and Halibut. It was a phenomenal meal, and I commented to my son that the best restaurants in Seattle could not prepare fish like this. Then he said, “Dad, it’s gets better. She cleans the fish, too.” I laughed so hard. She’s definitely a keeper. Brady owns his own 40 foot fishing boat, and he fishes mostly outside of Sand Point, Alaska down on the Aleutian Chain. He calls me for weather reports from his Satellite phone regularly and tells me stories about the bears on the beaches, the wild fox, and curious whales that come to inspect his boat. Fishing as a commercial fisherman is hard work, and you have to live by faith, believing that the fish will come each year. It’s a tough business, but it’s a good life too. It takes a lot of self-discipline and an independent spirit. But I think fresh fish for dinner every night sounds pretty amazing. The Sequim Dungeness River is one of our natural wonders on the Olympic Peninsula. It is the major source of water for the entire Sequim valley and most of the irrigation ditches, which have kept thousands of acres of farmland rich and fertile for 150 years. The Sequim Dungeness River pours out of the Olympic Mountains where it rains over 200 inches a year, and empties into the Strait of Juan de Fuca. High up in the mountains I could not resist taking a little video of the tranquility and beauty of the river. Sequim is famous for its Blue Hole or Rain Shadow, because we only get 16 inches of rain a year, one-third the rainfall of Seattle only two hours away. But we are in the great Northwest, rich in natural resources, beauty, and Sequim uniquely sits with the Strait of Juan de Fuca on one side to the North and the Olympic Mountains on the other side to the south with lush rivers, lakes, forests, and mountains everywhere. No wonder retirees from Southern California, Florida, New York, Colorado, Arizona, Alaska, Texas, and so many other states are attracted to Sequim. With the southern draughts, the crime problems, the pollution, high taxes and regulations, and now major immigration issues, retirees view Sequim as a Haven of the Northwest, and it is. As I stood on a sandbar of the Sequim Dungeness River high in the Olympic Mountains yesterday, I was reminded of why so many of us love the Sequim area. There are so many reasons, but peace and tranquility are certainly part of the appeal. The Sequim Dungeness River reminded me of that peace and tranquility. The Sequim Air Affaire was this past weekend, and it was a huge success. A major outdoor event depends so much on good weather, especially an event with airplanes, small jets, experimental aircraft, hot air balloons, and skydivers. All around Sequim it was raining and some areas had nasty storms. Not Sequim. Seattle had nightmares with rain, wind, major power outages, and many car accidents. Fortunately, the Sequim weather cooperated nicely for the Sequim Air Affaire. Saturday sprinkled on and off, but Sunday was absolutely beautiful, and I could not resist taking this photo of one of Sequim’s classic bi-planes. 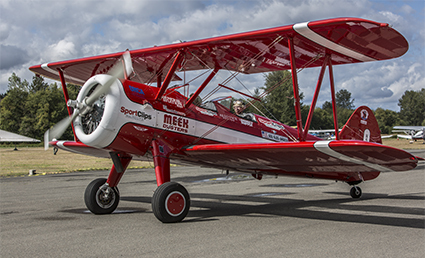 This red biplane is a 450 Stearman owned by Mike and Marilyn Mason. It is one of the most beautiful airplanes you’ll ever see. They were giving rides at the Air Affaire, and who wouldn’t want a ride in this aircraft? There are a lot of retired pilots in the Sequim area and several small airports. If you’re here next year at this time of year, you might want to join us at the Air Affaire. This weekend is the great Sequim Lavender Festival, and tens of thousands of people from all over the country are arriving, filling up every hotel room and every B&B. Sequim is the Lavender Capital of the U.S. now, and the weekend is full of Lavender tours and festivities. Click on this photo for an enlarged image of the focus of this Lavender Festival. The Lavender Festival is a major annual event here. You can view the Friday through Sunday Schedule at Lavender Festival. There’s a lot more going on than just sniffing lavender, too. Sequim has sprouted many lavender farms, and growing lavender even on a small scale is now required by city ordinance. 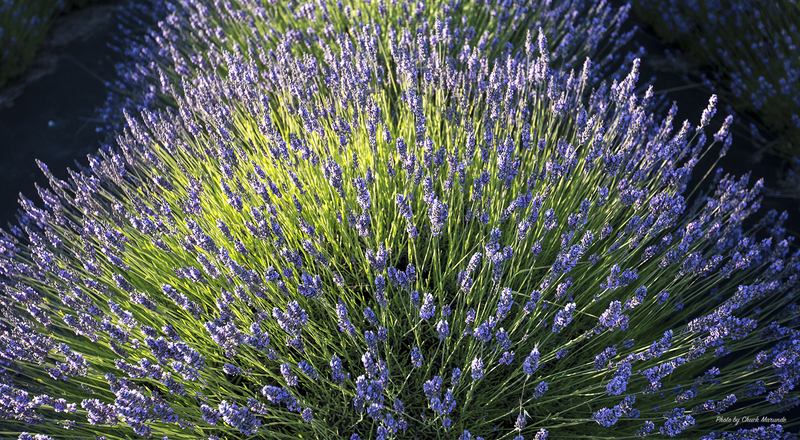 Well, that’s not true, but you’ll see lavender growing all over in Sequim and in many yards. 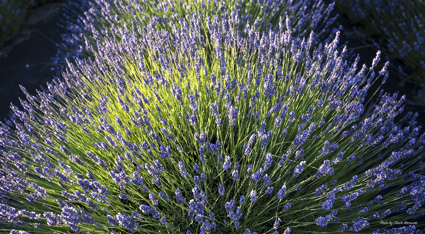 If you’ve ever thought about visiting Sequim, this is a great time of year to do that–during our Lavender Festival. How Far is Seattle From Sequim? Anytime Fitness in Sequim is a 24 hour gym, and if one of your goals when you retire is to live healthier, I suggest you tour Anytime Fitness. 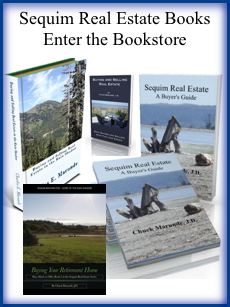 I write almost entirely about real estate issues on this blog, but I also like to periodically share why so many people are retiring to Sequim. 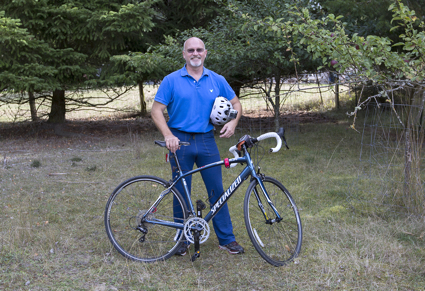 Sequim’s healthy lifestyle and environment is one those reasons. Many of my clients in their 50s and 60s are planning a retirement lifestyle that includes their own organic vegetable garden, better overall nutrition, and moderate exercise. There are several gyms in Sequim, so you have some choices. Anytime Fitness has recently expanded and has excellent facilities for muscle work as well as cardiovascular work. One of the things I appreciate about Anytime Fitness is that you get an electronic key, which allows you to work out anytime 24/7. 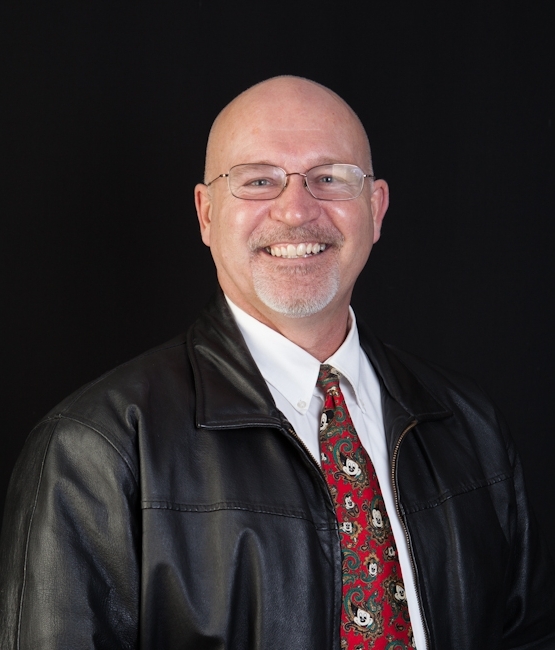 After a career of high stress, moving to Sequim is a remarkable transition, and I’ve had many clients who told me their stress levels dropped 95% after they moved to Sequim. We have just about every recreational activity you can think of, and while not all Sequim retirees work out at Anytime Fitness, the vast majority are able to find their place and love their lives here. Of course, the friendliness of the people has a lot to do with that. But if you do retire to Sequim, check out Anytime Fitness. Kayaking in Freshwater Bay is one of our best recreational activities on the Olympic Peninsula. It’s only a 30 minute drive from Sequim and 10 minutes from Port Angeles. Freshwater Bay is a sheltered bay with an excellent boat launch, and the clearest pristine water you’ll see kayaking anywhere. Kayaking is great for exercise, but it’s also great for the mind and spirit. There’s something about kayaking that is therapeutic. You can’t think about work when you’re communing with nature in a kayak. Stress just drains away, and you can’t help but experience the pleasure and pure enjoyment of kayaking. I took the photo above yesterday afternoon. I wish you could look at this photo and smell the fresh breeze coming off the saltwater and hear the gentle breaking of the waves. With three or four boats, this is about as crowded as it gets in Freshwater Bay on a beautiful afternoon. But there are many bays and rivers where you can enjoy kayaking from Port Townsend to Sequim to Port Angeles. Across the Strait of Juan de Fuca from Freshwater Bay is beautiful Victoria, B.C. Kayaking is a great recreational activity, because the physical part can be as strenuous or as relaxing as you make it. One thing for sure, we do have some of the best natural resources on the planet here, and Freshwater Bay is one of them. 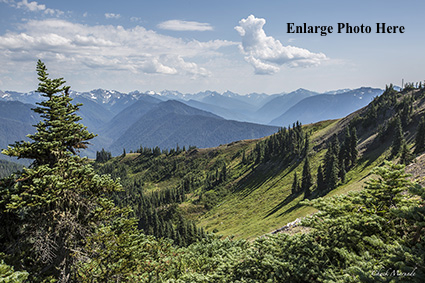 Hurricane Ridge is one of our national treasures, and with all this gorgeous sunshine, many of us will be driving up to hike Hurricane Ridge and take photos. 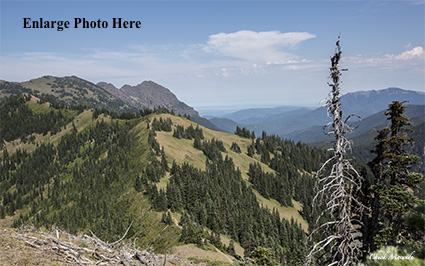 It’s only a 40 minute drive from Sequim through Port Angeles and into the mountains from there. The trails are very easy, and the natural beauty of the mountains and valleys reminded me of why so many of us love the Olympic Peninsula. You can enlarge these two photos, and I think you’ll see what I mean about stunning beauty. 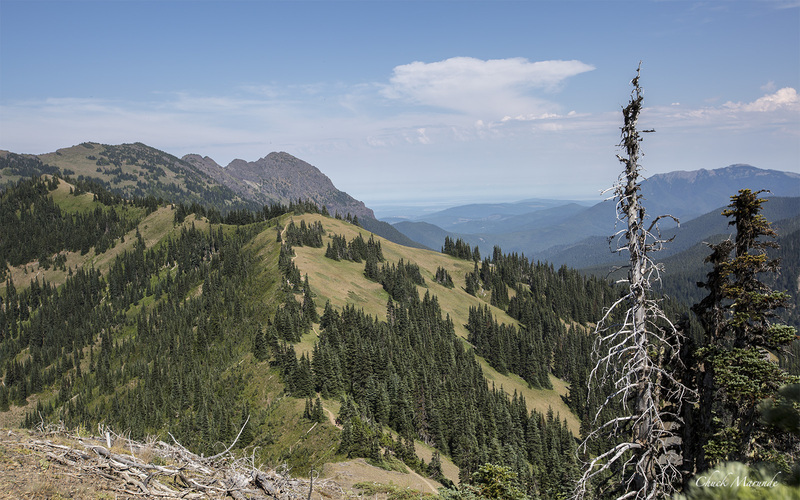 Getting out to see nature like Hurricane Ridge seems to re-connect us with something much bigger than ourselves and our individual problems in life. Looking at the majestic glory of these mountains and valleys, and the Strait of Juan de Fuca to the north, I always walk away refreshed and renewed for the week. Everyone I saw hiking had a look of delight on their faces. If you come up during the spring or summer, by all means try to make this one of your afternoon sightseeing trips. Hurricane Ridge is well worth the trip. 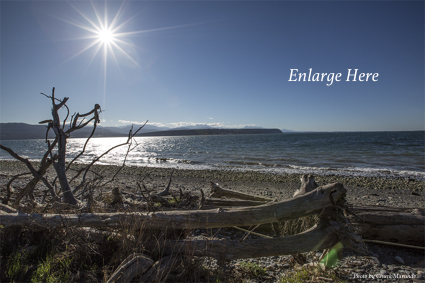 We have more Sequim beaches than you could walk in a year. I mention this not just because walking is great exercise for the body, but because there is something incredibly therapeutic about walking on a beach with the soft sand under your feet, the fresh salt water breeze on your face, and the soft sound of waves lapping at the beach. I’ve said before that if you could put together a checklist of 100 items of the most important things you would want in your community, Sequim would have more checked than any other place in the country. Hundreds of my clients have affirmed this over the past two decades. Sequim is incredible, and the beaches are one of our best features. Walking your dog or your husband on the beach is always refreshing. And there’s no question there is something soothing and even therapeutic about the sounds of water gurgling, splashing, and crashing. If you plan to visit Sequim and evaluate the area for a possible retirement home, be sure to take a little time during one of your afternoons and walk the Sequim beaches, or at least one. Port Williams is a wonderful walk. There’s a beach at the end of Oyster House Road off Marine Drive, and one of my favorites is the beach on the way to the Dungeness Lighthouse, the Dungeness Recreation Area off Lotzgesell Road. And if you are out west of Port Angeles for an afternoon drive, you really ought to check out Freshwater Bay, which is absolutely gorgeous, and further west is Salt Creek, another wonderful beach. 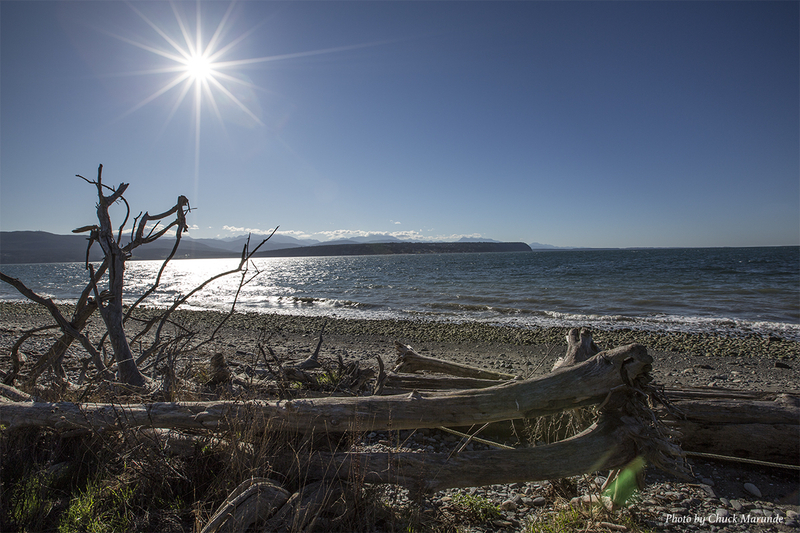 Sequim beaches are one of many reasons so many people love Sequim. 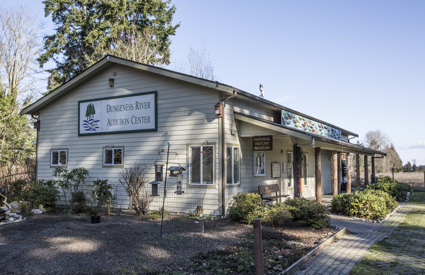 The Sequim Audubon Center is a major attraction at Railroad Bridge Park. I visited the Park yesterday because I wanted to look at the Bridge, which just survived a very high Sequim Dungeness River after a lot of rain in the mountains. The Bridge is temporarily closed as the wooden sidewalk on the other side of the river needs repair. While I was there, I couldn’t resist taking this photo of the Sequim Audubon Center with the sun shining brightly. The Dungeness River Audubon Center‘s “mission is to inspire understanding, enjoyment and stewardship of the Olympic Peninsula’s unique natural and cultural resources, with emphasis on birds, rivers, fish, and people.” It’s an excellent mission, because the Peninsula has some of America’s most beautiful natural resources and wildlife. Those of us who live here often joke about keeping our extraordinary mountains and rivers a secret from the rest of the world, and we kid about closing the gate at the end of town. The truth is, we only thrive if we keep growing at a manageable pace, and a big part of that is managing and enjoying this gorgeous environment. When you visit Sequim, be sure to add Railroad Bridge Park and the Sequim Audubon Center to your bucket list. For many who are on the verge of retiring, visiting Sequim often includes seeing the sights and driving around to look at homes. Thinking about where to retire is a big decision. Come and visit Sequim and check out the Sequim Audubon Center too. Sailing in Port Townsend is pretty popular, and on a nice day you can hardly count all the boats sailing in Port Townsend Bay and Puget Sound. It was late in the afternoon when I could not resist taking this photo of one of the most impressive little sailing boats I’ve seen in the Bay. 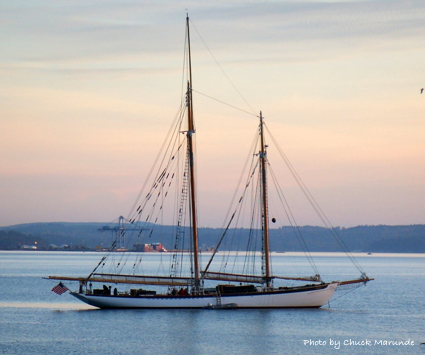 Port Townsend is known for it’s maritime activities, and it’s the home of the Wooden Boat Foundation. Nearby Port Hadlock is the home of the Northwest School of Wooden Boatbuilding. [Read my earlier article on Wooden Boats.] If you have thought about sailing in Port Townsend, I recommend browsing the Wooden Boat Foundation. The annual Wooden Boat Festival attracts over 300 boats, a lot of festivities, good food, and music. Many of us who live in Sequim love to drive down to Port Townsend for a weekend day or an afternoon and just walk the docs, enjoy one of the quaint little restaurants (like Doc’s Marina Grill), or walk through town to watch people. Just do it, and you’ll see why it’s so entertaining. Read more articles at Port Townsend. Whether you want to pursue sailing in Port Townsend or just enjoy this delightful waterfront community with a rich maritime history, come and visit soon. If I’m there, I’ll buy you a latte. The Discovery Trail is one of the best walking, jogging, and biking trails in the Northwest, and it is centered in Sequim. It stretches for many miles in either direction and extends far to the west side of Port Angeles. If your retirement plan includes regular exercise, the Discovery Trail is perfect for any level of exercise. I have been a jogger for over four decades, but recently I decided to try something that might be easier on my body, and so I bought this bicycle, and I am loving it. As I ride almost daily, I’m reminded of how much of a whole body workout you can get on a bicycle. Yes the legs are getting a workout, and the lungs too, but the abdominals and shoulders are getting it too. I have two sons who became professional athletes, one as a strongman who traveled the world competing, and one as a mixed martial artist who fought in the UFC. I wouldn’t recommend bike riding to build upper body strength for my sons, but as we get older, we aren’t exercising like we did in our 20’s. Vigorous cardio exercise and moderate muscle work on a consistent basis is very beneficial. Combine regular exercise, like riding a bicycle on the Discovery Trail, with organic food from Sunny farms or your own vegetable garden, and eliminate most junk foods, and Voila! Health and happiness forever. Sort of. If you haven’t walked or ridden a bicycle on the Discovery Trail yet, it’s definitely worth doing. It’s not a high traffic trail, and on a nice sunny day (or not), communing with nature is very rewarding. Do you like the Olive Garden Restaurant? The Pasta Fagioli with breadsticks and salad is a great and very reasonably priced lunch. Sequim does not have an Olive Garden, but it’s an easy drive to Silverdale where there is one. It’s a one hour drive, and well worth a Saturday or Sunday afternoon trip. Sequim could use more nice restaurants. 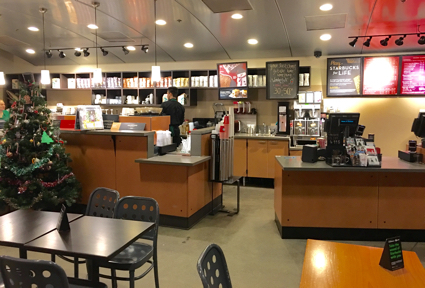 We have some fast food restaurants, but we have a limited number of fine restaurants. Here’s a nice little list of Sequim and Port Angeles restaurants with links to their websites: Sequim Restaurants. Not on this list are two new Sequim restaurants that are really fantastic. 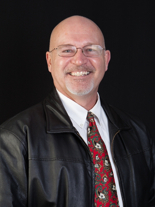 The first is Nourish Sequim, and you’ll find an article at Nourish Sequim. Another I love is Blondie’s Plate. Fantastic. The Docside Grill at John Wayne Marina is outstanding and deserves mention here. At some point I am sure we will see an Olive Garden in Sequim, but it hasn’t happened yet. Still, it’s worth the drive to Silverdale. Sequim crabbing is very popular. That’s not exactly a real estate subject, and most of the 1,600 articles on this site are about buying real estate in Sequim. But while you are here visiting and looking at homes, you’ve got to have some fun, too. 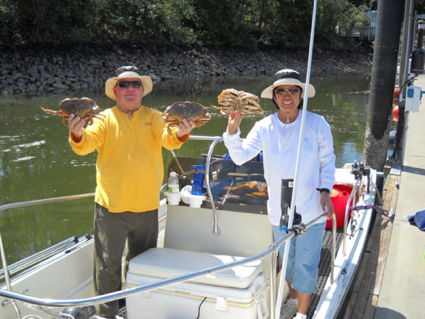 There are many things to do, but Sequim crabbing is definitely a favorite activity. Don and his lovely bride having far too much fun in retirement. Sportsmen catch more than a million pounds of Dungeness crab, using pots, ring nets, and for those who are wading or diving, with their bare hands. That’s a lot of crab. In the areas of East Juan de Fuca Strait, Port Angeles Harbor, and Discovery Bay the season is open from Thursday, July 3rd 2014, and remains open through September 1st 2014 (Labor Day). Crabbing is only allowed Thursdays through Mondays each week during the summer season (closed on Tuesdays and Wednesdays). You can learn more from the Washington Department of Fish and Widlife at Sequim Crabbing. Here’s what one visitor said about his Sequim crabbing experience, “Went crabbing out to Sequim last Wednesday and the family had a blast. Weather was great, caught lots of crab and did a little camping. Fished my pots a little deeper at about 120′ to 140′ and really nailed the crab. One pot had 16 dungeness and only one was not legal. Usually it is the other way around for us. Had a feast at the camp ground and came home and fed the extended family & friends. Family outings like we had are priceless. As I (and the kids) get older I am savoring them more.” Come and visit Sequim and try your luck at some Sequim crabbing. 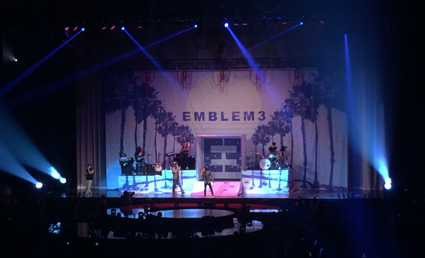 Seattle hosted an Emblem3 Concert with now famous Sequim residents Wesley Stromberg, Keaton Stromberg, and Drew Chadwick. These three young men (Keaton is only 17) are extraordinary musicians and entertainers. Sequim has produced some truly gifted musicians and athletes, including the Robbie Walden Band, the Lorentzen Family Singers, and my own sons, who became world class athletes in professional strongman and mixed martial arts. Living in Sequim means we have easy access to great Seattle concerts and events. It’s a short two hour trip and a pleasant drive or ferry ride. Emblem3 was actually the opening act of a Selena Gomez concert, and Emblem3 has been the opening act for Selena’s concerts around the country. These young musicians are not only gifted, they are young men of good character. I know this because I have watched them grow up in Sequim. Of course, since I have a teenage daughter, attendance at this Emblem3 concert was mandatory. This dad had a great time taking four teenage girls to an Emblem3 and Selena Gomez concert. The girls were as much entertainment as the musicians. Emblem3 performed one of their big hits, 3000 Miles. The song talks about the memories of being 3000 miles from home. It’s an emotional song for them, because they now live in California and being back home to perform this song clearly moved them and their fans. It seems very apparent that we will be hearing a lot more from Emblem3. Wesley, Keaton, and Drew are making Sequim proud. Emblem3 is also responsible for the noise that comes from many thousands of screaming teenage girls, but it’s all good. If you live in Sequim, you can take advantage of some great Seattle concerts, including Emblem3. 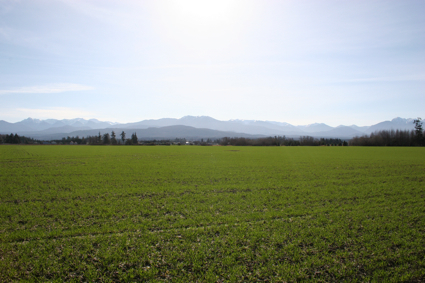 Sequim WA is farm country and has been for well over a century. This is one of the appealing things about the Sequim area. It’s a rural area with a peaceful agricultural setting, but we are lucky to have the modern infrastructure of a well organized county and city. We have subdivisions, albeit small ones, and we have country acreage (1 to 20 acres) with mountain views and water views, and plenty of fields with grazing cows or horses. But we are fortunate to only be two and a half hours from downtown Seattle. Farm fields and grazing cattle has been a common scene in Sequim WA for as long as any human has lived here. It’s not just the Sequim Blue Hole or the 16 inches of rain per year, or the sunshine, or the fact that we are off the beaten path of traffic and crime, it’s the peaceful setting and the friendliness of the people. 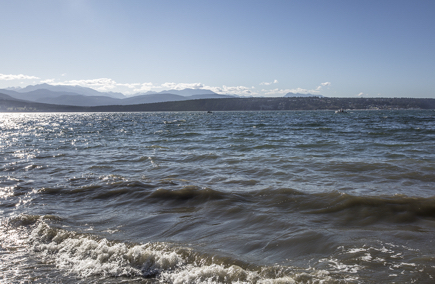 It’s the boating, the fishing, the biking and hiking, the Olympic Mountains, the golfing, and much more. It’s everything that combines to create a nearly perfect retirement community, which simply has never had a flood of people moving here. Growth has been slow but steady. That’s good, because real estate prices are not being pushed to ridiculous levels. Prices are stable and moving upward, but slow and steady. There are two small family owned dairy farms in Sequim. At one time the Sequim valley supplied fresh milk to the Seattle market almost a 100 years ago. Today the family farms are the last of a dairy empire. Read more about one Sequim WA Dairy Farms. 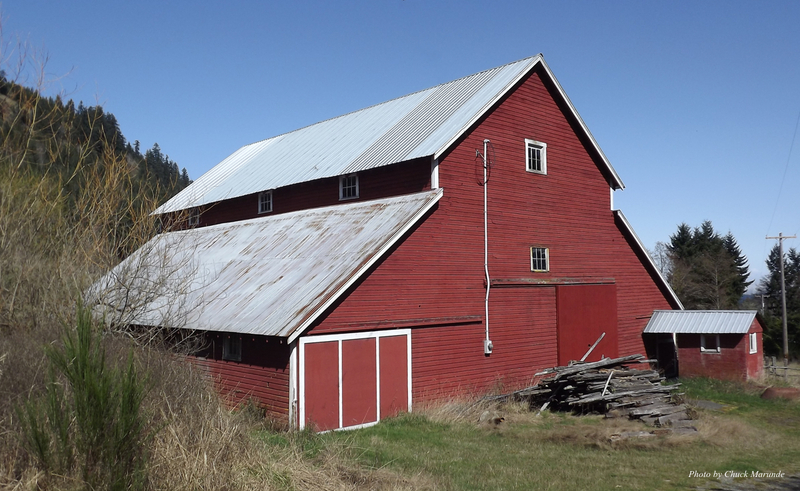 There’s something about a red barn that catches the eye immediately. A red barn always looks good, and any other color would just seem wrong. 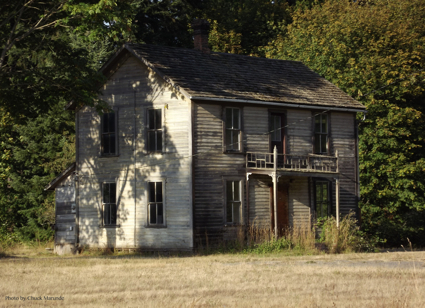 Sequim and Port Angeles has a heritage going back over a century as an agricultural area with grazing cows, dairy farms, fields of hay, and barns. Many of these barns are 100 years old, and while we’ve lost many over the years, some have been maintained and are still standing strong. It’s not easy to find a farm for sale or even a mini-farm on the Olympic Peninsula. It’s even harder to find a property for sale with a grand old barn. Such properties are extremely rare, but there also are not very many buyers for such properties. Farming is generally for the big boys, and mini-farms can be expensive. For a 10 to 20 acre mini-farm, even without a house and barn, it’s hard to get started in the Sequim and Port Angeles area for less than $400,000. Here’s a list of 80 properties listed in the MLS that have the potential to be mini-farms: Sequim Farm Properties. There are three I especially would mention. The first is a horse ranch with a gorgeous barn, although it’s not a red barn, and that one can be seen at: Port Angeles Horse Property. The second is up in the hills above Sequim on 15+ acres and you can see that one at: Sequim Horse Ranch. The third is a 17 acre ranch I lived on 16 years ago, and this one has a big beautiful barn that has been well maintained. You can learn more about this one at: Sequim Horse Property. John Wayne Marina is one of the premier marina’s on the Olympic Peninsula just west of Seattle. The northwest is popular for it’s retirement getaways, islands, protected bays, and straits, which has made the surface of the water out here one of the most attractive boating and sailing locations. The John Wayne Marina is owned by the Port of Port Angeles, and you can learn more about the Marina, fees, and the rules and regulations at Port of Port Angeles. Enjoy this Sequim photo montage of beautiful Sequim, Washington and some of our water and mountain scenery. I recommend you enlarge the video and watch it in HD, high definition video for the best viewing. Now is the time to plan your trip to Sequim. When the flowers are blooming in the spring and the sun is gently tanning your skin, it is a wonderful time to check out our water views and mountain views. If you enjoy hiking, bicycling, walking, fishing, kayaking, clamming, skin diving, nature photography, and many more outdoor recreational opportunities, you will love your mini-vacation to Sequim this spring or summer.